I don’t find anything unusual there. 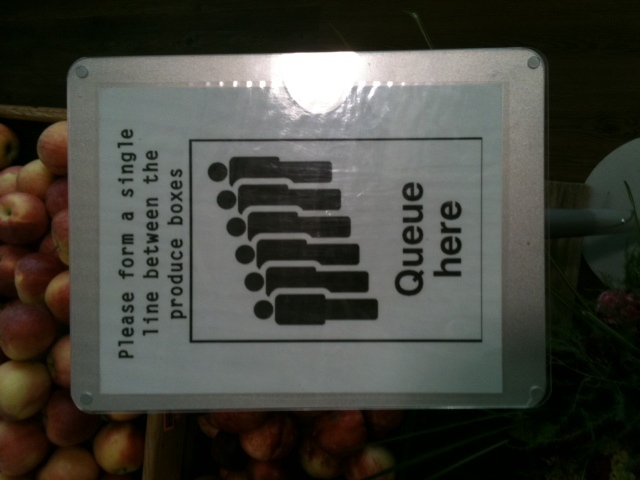 I’ve been queuing up for years, although I might be in the minority. I’ll give you that standing on line (in the New York area) and standing in line elsewhere prevails, but if I heard someone tell a group to queue up, or stand in a queue, I think most people would be comfortable with the phrase. I would roll my eyes at the use of queue within the US. It’s silly and pretentious. I’d complain about amongst, too – but I’ll admit most of my fellow Americans don’t know the proper use of “among” in the first place. The term “print queue” is commonly used in even the most general computer context. Accurate language is often denigrated as “pretentious” by those who are unfamiliar with the word.. I like this word. For one thing it means we can spell the same two phoneme syllable with one, three, or five letters. C and I can’t do that. I think this instance seems pretentious because it’s being used as a verb instead of a noun. I’d “join a queue” but I’d never tell a group of Americans to “queue up”.